This unique Clinker built Skiff was constructed by an old school, East coast boat builder. Hand crafted out the finest material available, she's what he chose to build for himself. Built to last, this gorgeous boat features exceptional detail and craftsmanship. 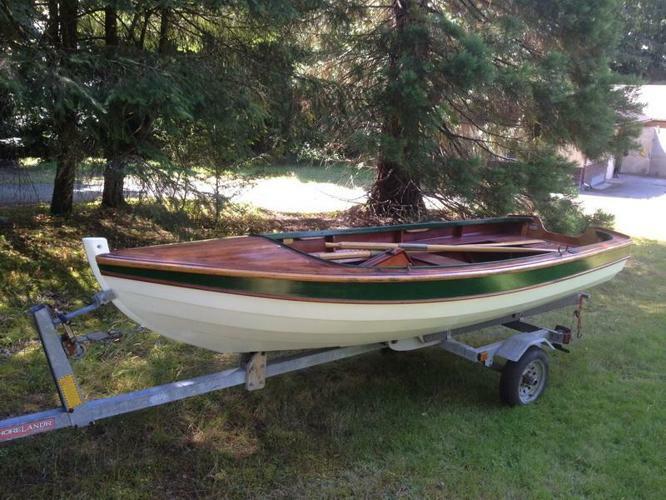 If entered in classic wooden boat show I'm sure she would win prizes. She's truly work of art. 16' long, she sits on a almost new fully galvanized trailer, the skiff can be rowed, sailed, and a even 10hp would push her along nicely. Unfortunately the mast, sail and boom have been lost to the mists of time. Everything else is complete. Open to reasonable offers.